Six a.m. and the morning 'plastic bag packing' begins; putting everything into an individually labelled bag, squeezing out the air to create a squished vacuum seal and then stuffing them into the backpacks. Pretty noisy task but at least here we have our own room so we are not disturbing anyone else. When there are no bags left and; hence, nothing left in the room, we are good to go. Despite this, about ten to fifteen minutes down the road, I always experience 'packing paranoia' and I fight the obsessive compulsive urge to stop and go through my pack to ensure that my money, my iPad, my glasses are indeed in the bag. So far they have been but you just can't let up...just ask John about his orange shirt that got left in Cizur Menor or Dayton about the legs of his zip-offs that are beside the fireplace in the gîte outside of Auch. 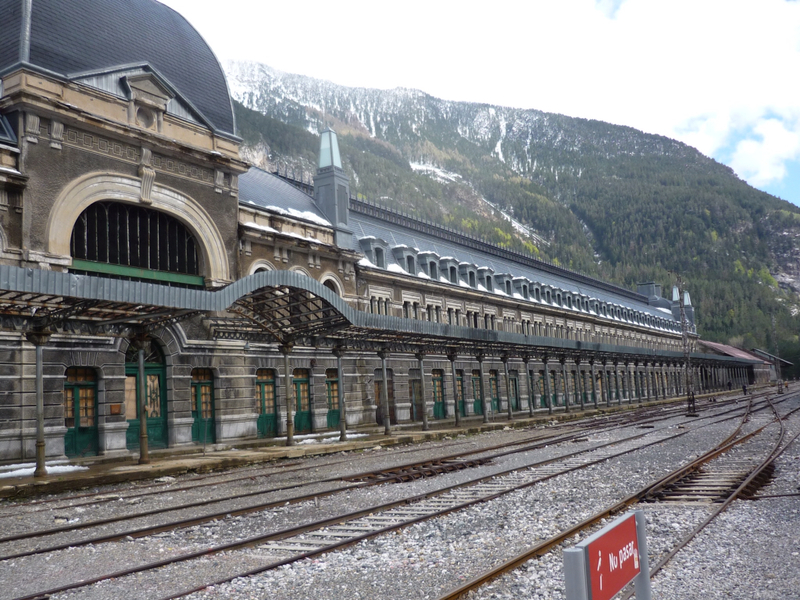 The reason this town is called Canfranc-Estación - the longest train station. The two British gentlemen, Tony and Peter, were also staying in this chambre d'hôtes so we all headed down to the local bar for dinner. We had asked earlier until what time they served dinner and were told until 8pm but for once we were wise enough to know that 8pm could mean 6:30pm and we got there early. The meal was pretty good and the wine was excellent. For a starter, Dayton had huevos con gambas (tiny shrimp) while the other guys had a garbanzo soup or tortellini and they all had a rather unspectacular meatball entree but, as I said, the wine was so good. I stuck with what will most likely be my vegetarian staple menu here.. ensalada mixta sin atún y sin huevos (salad without tuna or eggs). The weather app on the iPad does not have encouraging news for us this morning. Zero degree temperatures and snow showers so we will bundle up and have hope that we get to Jaca before the snow does. The thing about the weather here is that no matter what you see at one moment you can only count on it being like that for maybe another 37minutes at most. The weather here changes that quickly, from dry and sunny to cloudy and rainy or sleeting or from clear and warm to freezing. 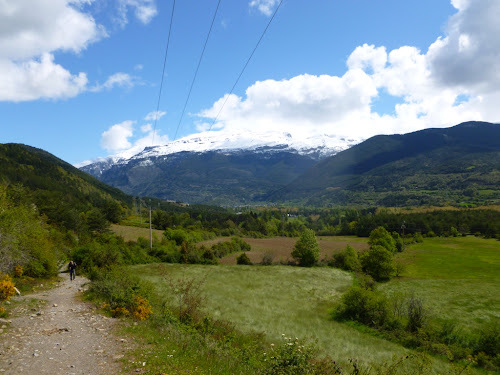 So now it is 6pm and we are in Jaca after a good day of walking. 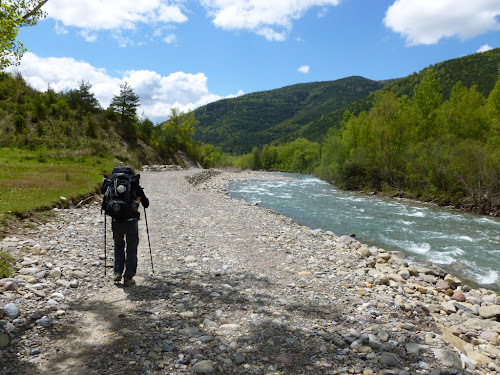 We decided to chance the Camino route despite some warnings that with the recent wet and snowy weather it was washed out and dangerous. It turned out to be an okay choice; the route was very rocky but dry, a lot slower than taking the highway but all in all it was good. We stopped for a midday break in Casteillo de Jaca and Dayton had his first Spanish bocadillo lunch on this trip; a huge baquette the length of his arm with slabs of fried bacon and queso (cheese), no butter, no mustard, no mayo... just big and dry. Dinner in Jaca was a take away vegetarian pizza. As Dayton says, he can get tapas and raciones any where any time. There might be a hint of sarcasm in that comment. The weather is always a major concern but today, despite the forecast, it favoured us. We were a little like Goldilocks; it was too cold at the start, then a little warm, then it was starting to rain, then it stopped, then it got cold again, then it was hot....oh my goodness layers of shirts and jackets, neck scarves and gloves were off and on all day. However, any day you are not wet and muddy all day is a good day on the Camino. I must admit I have to make an attitude adjustment for the rest of this Camino. I saw the end in sight and somebody moved it! I miscalculated and thought we would be finished the Arles/Aragon route this coming Friday but I missed a stage!!!! AAAArgh. It is like coming to the end of the half marathon and the finish line is moved 31 kms further along. 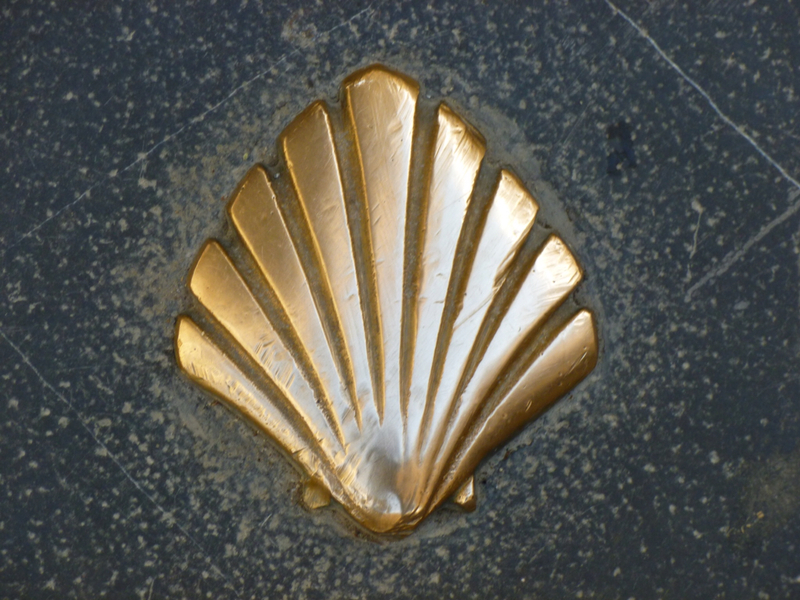 Tomorrow will be Day 31 of walking which is the number of days it took us to finish the Camino Frances. I am already way over 1,000,000 steps on this route. Karen, in honour of your pilgrimage, I just finished watching "The Way", all about a man's journey along the Camino after his son dies on it. Amazing movie, and I thought of you and Dayton all the way through it. So love that movie. "You don't choose a life. You live it". It reminds me of "Don't dream you life. Live you dreams." Did you remember to start si si'ing?